Unnatural Selection is a stunningly illustrated book about selective breeding--the ongoing transformation of animals at the hand of man. More important, it's a book about selective breeding on a far, far grander scale--a scale that encompasses all life on Earth. We'd call it evolution. A unique fusion of art, science, and history, this book celebrates the 150th anniversary of Charles Darwin's monumental work The Variation of Animals and Plants under Domestication, and is intended as a tribute to what Darwin might have achieved had he possessed that elusive missing piece to the evolutionary puzzle--the knowledge of how individual traits are passed from one generation to the next. 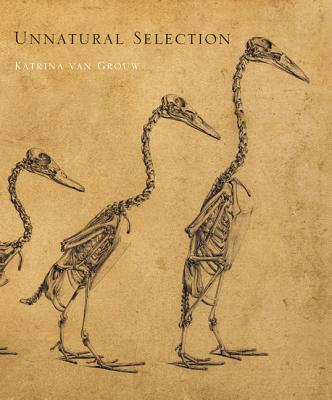 With the benefit of a century and a half of hindsight, Katrina van Grouw explains evolution by building on the analogy that Darwin himself used--comparing the selective breeding process with natural selection in the wild, and, like Darwin, featuring a multitude of fascinating examples. This is more than just a book about pets and livestock, however. The revelation of Unnatural Selection is that identical traits can occur in all animals, wild and domesticated, and both are governed by the same evolutionary principles. As van Grouw shows, animals are plastic things, constantly changing. In wild animals the changes are usually too slow to see--species appear to stay the same. When it comes to domesticated animals, however, change happens fast, making them the perfect model of evolution in action.